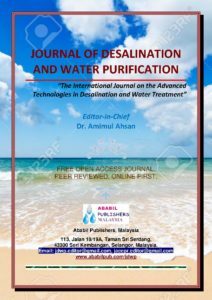 Journal of Desalination and Water Purification (JDWP) is a fast track international journal publishing peer-reviewed papers on the advanced technologies in desalination and water treatment to cope with water demand, including sustainable sources of potable water. Journal of Desalination and Water Purification (JDWP) welcomes theoretical and experimental research as Full Text Papers, Short Communications, State-of-the-Art Reviews and Letters to Editors. Short Communications should be concise and novel with advanced knowledge that warrants speedy communication to the readership. Desalination, renewable energy, heat and mass transfer, thermal, membranes, coagulation, sedimentation, energy, energy recovery, seawater, brackish water, environmental impacts; health considerations; risk assessment; cost, performance, water purification, water quality, water treatments, environment, leachate; wastewater, greywater, rainwater, stormwater treatment and reuse; industrial, agricultural and environmental applications; quality aspects; design and application of water reuse systems; economic, social and policy issues; surface and ground water sources. Copyright © 2015-2016 Ababil Publishers (Malaysia). All rights reserved.